As a startup, hiring is a critical component for your company’s success. The difference between your company scaling and stalling is the expertise of your team. For younger companies even, a single bad hire can jeopardize the business. At Quest Groups, we connect the dynamic talent with growing startup companies. Scaling startups isn’t easy, and we’ve experienced all the growing pains that our clients are feeling when they reach out for help. We know how to weather those storms and walk the talk while providing expert talent acquisition advice and services.. The companies and the VC firms we represent have both the knowledge and experience required to succeed. Our top-tier candidates have the unique background and expertise needed to help those companies grow. We use our industry relationships and experience in evaluating talent to connect and scale: the candidate’s career; the company’s talent base; and the VC firm’s investments. In order to make your early-stage company a high-growth company, you need to have the best talent on your team. When your company needs the perfect candidate to propel your growth, look to Quest Groups for talent solutions. Our strength is who we know and how well we treat them, which is how we do business better than the competition. Each vertical we serve has a dedicated team of Quest Groups recruiters. 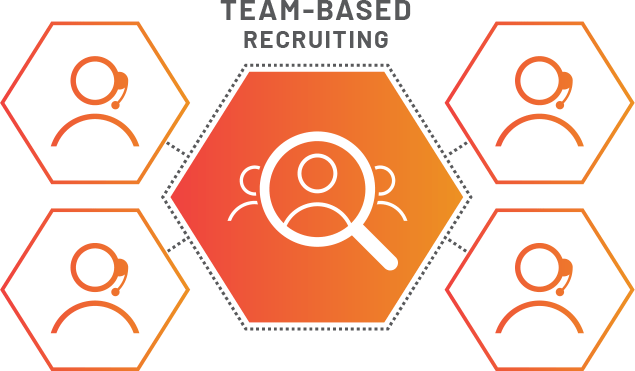 Instead of working with one candidate or one company at a time, our teams have as many as eight recruiters focusing on a single client and filling open positions with the right candidates as efficiently as possible.